Buy a Teenage Cancer Trust Rock T-Shirt from http://www.mandmdirect.com/, to raise money for charity and stand the chance to win two tickets to see Jessie J at Teenage Cancer Trust’s Royal Albert Hall gig. 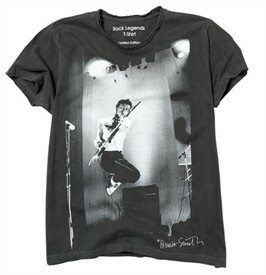 MandMDirect, one of the largest online discount clothes retailers in Europe, have teamed up with Teenage Cancer Trust to create a series of Rock Legend T-Shirts. All profits from the sale of the t-shirts will be donated to the charity and will go towards providing specialist facilities for young people with cancer across the country. In the weeks running up to Teenage Cancer Trust at The Royal Albert Hall, MandMDirect will be running a competition, offering customers the chance to win tickets for the charity gig. 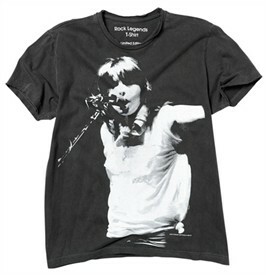 Everyone who buys a Teenage Cancer Trust Rock T-Shirt, between 9am on 1st March 2012 and midnight on 18th March 2012, will automatically be entered into a draw to win two tickets to see Jessie J on Sunday 1st April. Already a global pop phenomenon and international hit songwriter, Jessie's multi octave voice and sky high heels are now earning her a reputation as one of the world's leading live performers. Set list favourites include her number one hit singles ‘Price Tag’ and ‘Domino’ from her platinum selling debut album ‘Who You Are.’ For further details about Teenage Cancer Trust at the Royal Albert Hall, visit http://www.teenagecancertrust.org. The Rock T-Shirts were inspired by the distressed look of 60s and 70s band tee’ and include vintage prints of the legendary artists, who have all performed at Teenage Cancer Trust's annual concert series at the Royal Albert Hall. 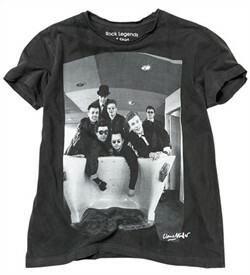 There is a limited number of the Tees, which are available for £14.99 at http://www.mandmdirect.com/. MandMDirect, have been supporting Teenage Cancer Trust for over six years. Through staff fundraising, donations from sales and bespoke products they have raised in excess of £860,000, which has helped the charity build more specialist teenage cancer units in NHS hospitals across the UK, allowing young people to be treated together with others their own age, in an environment suited to their needs. Roger Daltrey has worked tirelessly year on year to secure the best line-up for Teenage Cancer Trust at the Royal Albert Hall raising over £14million in eleven years. Amongst those that have appeared are Jimmy page and Robert Plant, Noel Gallagher, Liam Gallagher Paul Weller, Oasis, Depeche Mode, Coldplay, Eric Clapton, The Cure, Muse, Arctic Monkeys, Stereophonics, Kasabian, Suede, The Specials, Madness, Keane, Kaiser Chefs, Franz Ferdinand, Goldfrapp, Tom Jones, Jools Holland, Them Crooked Vultures, Razorlight, Bloc party, Biffy Clyro, Duffy, Antony and the Johnsons, Florence + the Machine, Squeeze, Beady Eye, Editors, Tinie Tempah and Jessie J. The shows have also played host to the cream of British comedy, including Ricky Gervais, Little Britain, Horne and Corden, Steve Coogan, Peter Kay, Jimmy Carr, Rhod Gilbert, Simon Pegg, Russell Brand, Noel Fielding, John Bishop, Kevin Bridges, Greg Davies, Miranda Hart and Jason Manford. Teenage Cancer Trust is the only UK charity dedicated to improving the quality of life and chances of survival for the six young people aged between 13 and 24 diagnosed with cancer every day. We build specialist units within NHS hospitals bringing young people together to be treated by teenage cancer experts in a place designed just for them. We want every young person with cancer to have access to this specialist support, no matter where they live. Traditionally treated alongside children or elderly patients at the end of their lives, young people can feel extremely isolated during treatment, some never meeting another young person with cancer. Being treated alongside others their own age can make a huge difference to their whole experience. Teenage Cancer Trust also educates young people and health professionals about cancer to ensure a swift diagnosis and referral to specialist support. Cancer in young people is rare but we want young people to know the common signs and symptoms so they can seek medical advice if they are worried. We rely solely on donations to fund our vital work. You can help transform the lives of young people with cancer. Visit http://www.teenagecancertrust.org to find out how. Teenage Cancer Trust is a registered charity, no. 1062559 (England and Wales) and SCO39757 (Scotland).